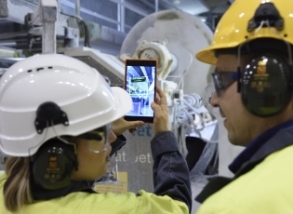 The utilisation of augmented reality was first tested at Stora Enso's Oulu mill where real-time information is being used in mill maintenance. Sept. 12, 2018 - Stora Enso has been developing augmented reality (AR) and 5G technology solutions together with Telia. The utilisation of augmented reality was first tested at Stora Enso's Oulu mill where real-time information is being used in mill maintenance. The application of augmented reality and virtual models will in the future enable the more rapid use of, for example, maintenance information at Stora Enso mills. Using a virtual model of a machine and real-time data concerning information points, can improve the operational reliability of the mills. "Stora Enso has an extensive digitalisation programme, which aims to increase sales and boost our operations on our journey to replace fossil-based materials. Through our digitalisation programme, we have become pioneers in our industry in the utilisation of new technology,” said Teemu Salmi, Stora Enso's CIO and Head of Digitalisation. Through the new technology, all necessary information is easily and visually at the disposal of experts in real-time, regardless of physical location. The nearing introduction of fast 5G technology together with AR and VR technology and 360° views will enable real-time and rapid utilisation by experts between different units, irrespective of geographical distance. Augmented reality refers to a view that can be augmented by elements produced using computer graphics, which are examined through displays. Stora Enso is a leading provider of renewable solutions in packaging, biomaterials, wooden constructions and paper on global markets. To learn more, please visit: www.storaenso.com.